The Linq Promenade is an "off the strip" experience, located next to the Linq Hotel. If you don't like the crowds of the main strip, this side strip where you will love to hang out! It offers as much thrill and excitement, but on a smaller scale. Tale a stroll off the strip and enjoy a fine assortment of eateries, boutiques, spirits and entertainment. This is my new go to spot in Las Vegas. It only took 5 visits for me to discover it, ha! 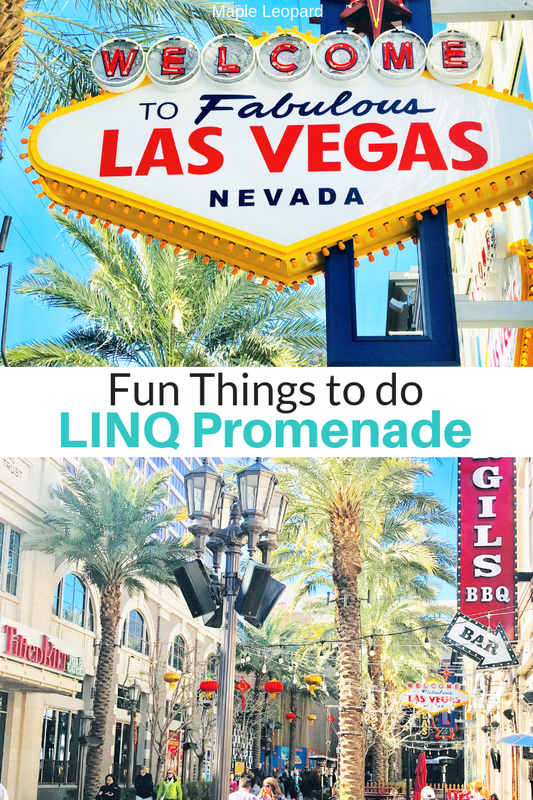 Next time you visit Vegas check out Fun Things to do on the LINQ Promenade. Burgers your way, animal fries and fifty vibes are the signatures of this beloved fast food chain. In-n- Out started in California in 1948, and has expanded to other states. If you've never set your chops on one of these juicy burgers, you are missing out! Whenever I fly to Vegas or CA, In and Out is always my first stop upon arrival. Rumors do fly about a "secret menu" and many wonder what's on it. According to the website, there isn't really a menu with hidden choices. You can ask for your hamburger a certain way: double double, triple, or quadruple patties. Wow, I can't even imagine trying to eat one that big! Also the fries are fresh cut and delicious. If you want to get the ultimate In-n-Out experience, do order the animal fries: yummy! The High Roller Wheel is the world's highest observation wheel. The views from the top will be sure to take your breath away. Take in a 360-degree view of the strip and the surrounding Las Vegas Valley. If you like to hang out in the sky, this is the ride for you! The 28 cabins are very spacious and can be reserved for special events, corporate parties, or group rides. An upgrade ride is available offering an open bar with your own bartender. Each rotation takes about 30 minutes. Chocolate, yes please! No need to visit San Francisco to indulge in the decadent treats Ghirardelli is famous for. Step right up order a thick chocolate shake or sundae, and start counting calories. I walked by this shop 2 or 3 times before giving into temptation. Oh my, it was a difficult decision with so many irresistible sweets staring you in the face! The hot fudge used in all the sundaes and milkshakes is homemade. Ghirardelli is known for top quality goodness and rich ingredients. Make sure you arrive on an empty stomach, the tasty treats are very filling. Nine specialty shops are available to browse and get your shopaholic fix. From the fashion savvy hipster to the Harley Davidson fan, there is shopping for everyone. The famous Honolulu Cookie Company has a shop here too, with the best shortbread cookies you ever tasted. Just walking up and down the Promenade at night was excitement enough for me! I love all the flashy signs, and glitzy lights illuminating the street. The High Roller hiding out back and the palms swaying in the breeze, make for a perfect night out. If you like to play beer pong and sample a wide menu of beer offerings, O'Sheas Irish Pub is a fun stop for the night. Live music is offered along with outdoor seating. Also popular on the promenade for nighttime are Jimmy Kimmel's Comedy Club and American Beer & Cocktails. The Flamingo is flamboyant and colorful, and that's why I love it! It is one of the three oldest hotels on the strip. The other two are the Tropicana and Caesars Palace. These 3 hotels are historical icons, and so much fun to explore. The Flamingo was originally the "Pink Flamingo Hotel and Casino, associated with Bugsy Siegel the famous mobster. You can read more about his story here. Enjoy vintage vibes for your photo shoots, or throw back to the 70's and see the Donny and Marie show. Bowling is always fun, and who knew you could do it near the strip, with live music to boot. Brooklyn Bowl is a destination music venue in Las Vegas. Enjoy a game of bowling while rockin the night away to live musical performances. There are also 6 different cocktail bars located throughout the bowling alley. There are only two places that I know of in the city to do zip lining. This one at the Linq and one in old town Vegas in Fremont. Get the adrenaline going and have an electrifying ride through the sky. You will be gliding 12 stories above the promenade. All dare devils line up and experience the thrill of your life! 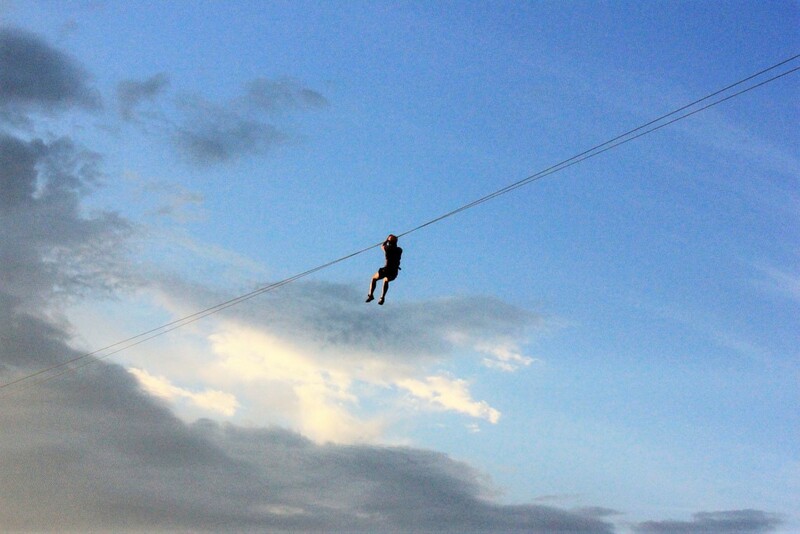 I've never tried a zipline before. rest assured my first time won't be flying over a concrete jungle. I'll only zipline where there is lots of green pasture or padding below! Coming soon in a few months to the LINQ Promenade a modern day Candy Land: I love Sugar . I"m really bummed it was not open when I visited this month for my birthday. The new flagship store will be a destination Vegas attraction. It will feature over 14,000 feet of candy paradise, and will be one of the world's most visited tourist spots. OH, and don't miss the 2nd floor where you can get lost in a chocolate haven. Also on tap: candy martini's- imagine that! This store is where everyone will be vying to capture the most instagram worthy moments. I can't WAIT to go back just to see this store! Next time you go to Vegas, I hope you will check out the Linq Promenade. If you are wondering what to wear in Vegas: check out my ultimate style guide here & additional travel tips here. Happy travels, hope to see you next week for my continued series on visiting Las Vegas. *Also if you are road trippin through the Southwest: check out the amazing sites you can see in Arizona in a four day weekend. Now I have to go to Vegas! I hope you do...you will love it! So much fun! The only thing I miss about my last job was the annual trips to Vegas. The Linq ferris wheel is a ton of fun, especially when you book the all-you-can-drink room! I heard about that drink room, LOL...it would be fun to book a cabin on the wheel for a girls night out! 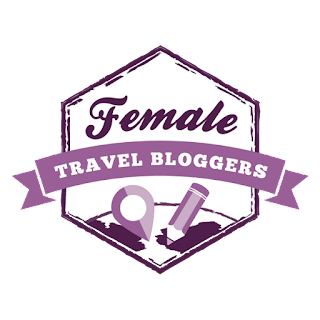 Great post on what to do in Vegas! Will check out the Linq Promenade next time. Hi Leanne sure hope you do, its so much fun! The Ghirardelli shop would have to be my favorite place, I would stay there for my whole stay. 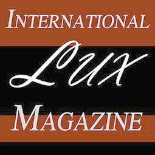 Ha ha Luci..it was one of mine,and hard to stay away from - right around the corner from my hotel...OH MY! HI Dani...I hope you make it there, and thank you so much! Yes this a very instagram worthy spot..it is less crowded for sure! I am afraid when the new candy store opens tho- the crowds may be like the main strip..hope not! I haven’t been to Vegas before but this makes it look like so much fun! Great to see that there’s fun things to do beyond the casinos. I’m thinking I’ll be indulging in burgers and shakes when I visit! Ha Claire, I love your way of thinking..:)) indulging at IN n Out always makes me happy. ha ha! Yes so much more to do then gamble and drink! One of my dream city to visit. I haven't been to Vegas before but planning to visit. Looks like there is a some much fun to do here. I sure hope you can visit soon, you will love to go back again and again! Oh my goodness the High Roller looks terrifying but amazing at the same time! Right?! I so agree..I want to try it next time..even though I am terrified. he he! So fun! I loved both times I've been to Las Vegas, even though I was underage both times. I'd love to go back and experience it to its fullest. Oh yes you have to go all the fun adult stuff..after all it is ADULT Disneland.. ha ha..in my opinion anyway..I LOVE IT ..every minute! I haven't been to Las Vegas in a number of years and I honestly don't remember loving it, but I do appreciate a good In & Out burger! I'm sure I'll be back at some point in the near future regardless - thanks for this! Hi Lauren, yes It's not everyone's cup of tea...I do love it like crazy for some reason ha ha! And yes In and Out is good any day of the week! Hahahaha this is fab, I love that your first list item is In-N-Out in Las Vegas! Seriously, I'm from the Midwest, and the first thing I do when I get out West is stop at an In-N-Out. 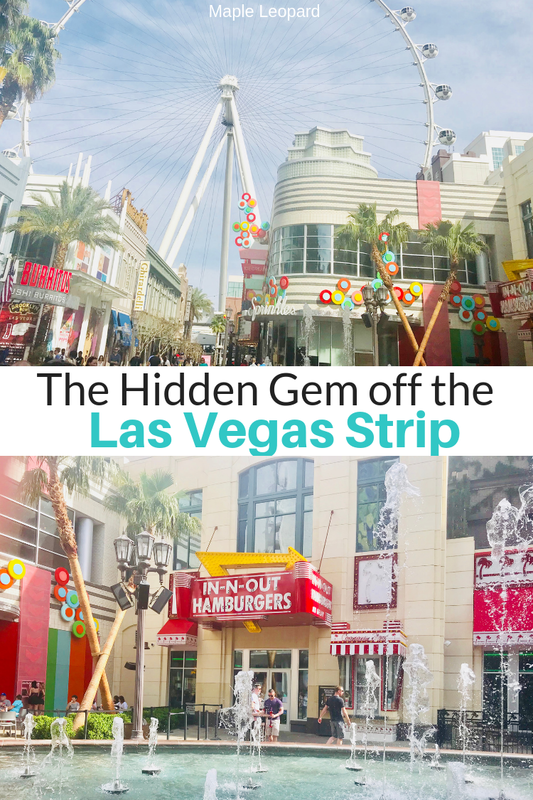 You're speaking my language with this Las Vegas guide! Ha ha yes who can refuse IN and OUT....we don't have any here in Seattle! Oh yes ..we are on the same channel.. ha ..! Oh perfect suggestions as I am going to Vegas in a few months. I've always spent time on the strip on past trips so this should be something different. It definitely is a break from the craziness of the strip, I just love it and I am sure you will too! Oh I love this post! I'm going to Las Vegas this year for the very first time, even more exited now haha! Hi Amanda, that is so awesome..you will love it and want to go back many times..I have been 6 times and now I want to move there..obsessed!! Yes exactly most peeps think its all drinking and gambling..sooo not true! Funny thing is that I was just looking up flights to Las Vegas yesterday! Will definitely be visiting Linq Promenade next time I am in town! Awesome, well i Hope its useful for when you visit! I have been to Vegas but unfortunately not to Linq Promenade. Loved reading about this street. Thanks for sharing. Thanks Chirasree, Hopefully you can check it out next time!